You will begin your Shirodhara Bliss Therapy with a warm herbal oil massage to your scalp, face, neck, hands and feet. Next we begin the Shirodhara, a unique and profound Ayurvedic treatment that especially acts to heal and address the psychological and spiritual aspects of a person. In Sanskrit, ‘shiro’ means head and ‘dhara’ means flow. 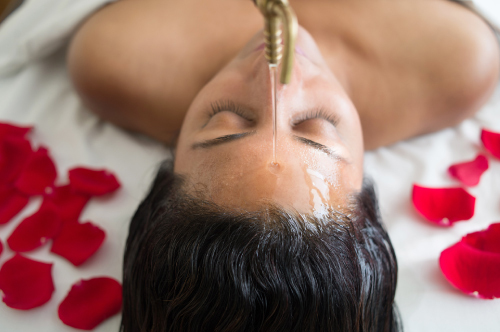 Shirodhara involves the practitioner pouring a stream of warm, herbal oil over the third eye center and forehead. It is this steady, rhythmic pouring of oil that induces a deeply relaxing and blissful state of consciousness called ‘Turiya’ ~ the state of awareness that is neither fully conscious nor deep sleep. While in this Turiya state, we are able to witness and/or release impressions in our conscious and subconscious mind. The brow and third eye center are associated with the fundamental endocrine glands (pituitary, pineal & hypothalamus), which regulate all hormonal secretions. These hormonal secretions are responsible not only for the autonomic responses which control digestion, breath, elimination, etc., but are also responsible for our moods and emotional states. Shirodhara is meant to establish a state of parasympathetic repose, an ego-less state, during which the innate intelligence of our body is revealed. During the session, we lovingly weave in sounds and aromas to delight your senses. You will emerge from your Shirodhara Bliss Therapy feeling so refreshed, as if you have just completed a long, deep and blissful meditation. *** Shirodhara may be added on to an Abhyanga session as well.